Hollywood works in funny ways. 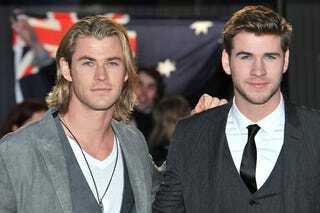 Apparently, both Hemsworth brothers tried out for Thor, and Chris botched his first audition, taking him out of the final running for the titular role until Joss Whedon—who had worked with the elder brother on Cabin in the Woods—made a call to Kenneth Branagh and asked him to give Chris another chance. Incidentally, Whedon saw Chris Hemsworth as Captain America first, which I’m glad didn’t happen since Chris Evans is killing it in his role as Steve Rogers. You can read more of Vanity Fair’s profile on Chris Hemsworth here.